The morning of August 11, 2009, I went to Monterrey, the industrial city of México, to visit B.O. Monterrey is the capital city of the state of Nuevo León; since it is surrounded by dramatic hills and mountains, one of its nicknames is City of Mountains. 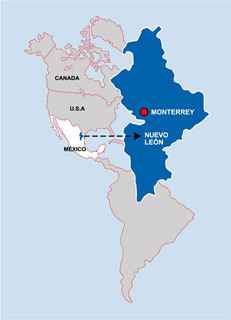 Here is a map showing Nuevo León and Monterrey. In México, men from Monterrey are known as regios; women, as regias. Regio is a contraction of regiomontano, where regio refers to “king” or rey, and montano refers to “mountain”, or monte; hence Monterrey. This discussion of regional stereotypes indicates that the regios are known in México as workaholics. Indeed, the slogan of the state of Nuevo León is “The State of Progress”; e.g., see this 2008 business report. Here are some photos of Monterrey and surrounding areas. Here’s a dramatic photo of Cerro de la Silla (which translates to “Saddle Hill”, according to Wikipedia), a prominent geologic feature visible in Monterrey. The Wikipedia entry says that the hill is actually in the adjacent city of Guadalupe. Still, Cerro de la Silla is considered the symbol of Monterrey. Here’s a photo from the top of Cerro de la Silla (I didn’t take this photo). Here’s a photo of B.O. 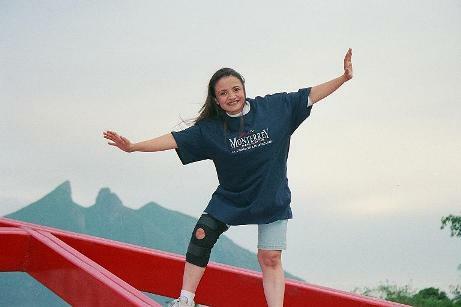 with Cerro de la Silla in the background. And here’s a photo of B.O. 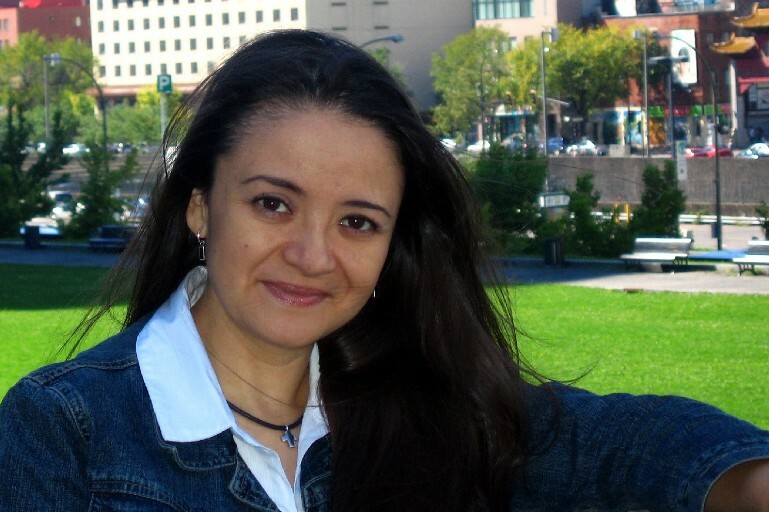 in Montreal, in 2006. Below is a quick summary of my visit to Monterrey. I will go into more detail in a series of follow-up posts over the next few days; in the table below, each date is a hyperlink to my blog post for that day. I think I’ll do one post for each day. August 17 Split a sandwich at Starbucks with B.O. ; then we visited the Sanctuario of Schoenstatt; then went to the airport to return to the U.S.
Sirva este medio para presentarme a sus órdenes! Es por ello que me dirijo a usted con el fin de solicitarle, de la manera más atenta, nos proporcione el permiso de reproducción correspondiente. Cabiendo aclarar que se otorgaran los créditos según nos indique. En espera de contar con su comprensión y apoyo, aprovecho la ocasión para enviarle un cordial saludo. Serve this medium to introduce myself to your orders! That is why I am writing to ask you, the most attentive, give us permission to play for. Fitting clarify that the credits will be awarded as we please. Waiting to have your understanding and support, I take this opportunity to send a cordial greeting. Dear Mr. Corona, certainly, I give you my permission to use that photo. If possible, please mention this blog as the source, but I realize that this might not be feasible depending on the editor’s policy and the layout of the book. When the book is published, I’ll be sure to look for it. Estimado Sr. Corona, le doy mi permiso para usar esa foto. Si es posible, por favor mencione este blog como la fuente, pero me doy cuenta de que esto podría ser infactible a causa de las reglas del editor y el diseño del libro. Voy a buscar el libro cuando se publica.